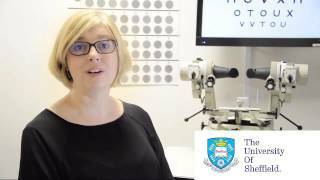 Why Study Orthoptics in Sheffield? Develop your specialist knowledge, skills and experience to build a rewarding career that improves lives. Orthoptics is the investigation and management of disorders of binocular vision and defects of eye movement. We're a welcoming and sociable community, dedicated to nurturing our students' talents and to upholding the core values of the NHS. You will develop scientific, clinical and patient skills such as communication, empathy and problem solving to prepare you for a career as an orthoptist. You need to be able to work as a part of a team and enjoy problem solving and science subjects such Biology, Physics and Maths. Orthoptics could be the career for you if you enjoy working with people, have good communication skills and are compassionate about improving people’s lives. From Sept 2019 the course will include a new subject that will allow graduates to sell, supply and administer approved medicines.